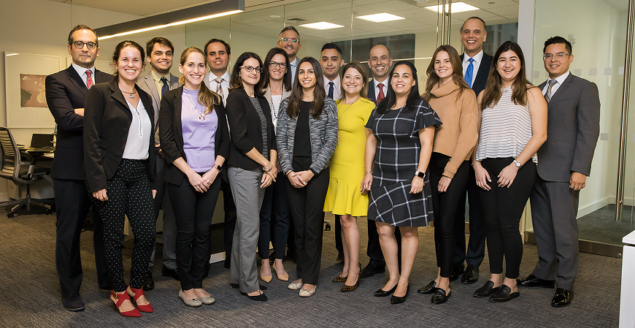 Our LLYC Miami office, which opened July 2015, specializes in handling multi-regional projects and looking after corporate clients; services that clearly highlight the value of our extensive network in Latin America. Its business targets are focused on several areas: strategic planning for multinational companies operating in Latin America; M&A operations in the region, the closures of which tend to take place in Miami or New York given their large presence of international law firms; communications for multilatina companies operating out of South Florida; litigation management between Latin American companies with Florida court hearings; as well as the regional Family Offices that manage fortunes from the United States. We are consolidating our unique value offering in the United States to accelerate our growth in the region through our Latam Desk in New York City (specialized in capital market projects, as well as financial and consumer goods companies), our Latam Desk in Washington, DC (specialized in corporate/public affairs for the private sector) and our consultancy services to multilateral organizations and international aid funds. We also offer communications training services to executives, as well as promotion and development services for corporate meetings and events held in the city of Miami, a strategic city for relations between North America, Central America and South America. LLYC’s client portfolio in the United States includes high-level international companies operating in Latin America, such as AB InBev, Amdocs, Astellas, Americas Society/Council of the Americas (AS/COA), HPE Aruba, the International Copper Association, Bayer, Boeing, Cogeco Peer 1, CenturyLink, Delta Air Lines, DHL, F5 Networks, Fortinet, Merck & Co., Pratt & Whitney, Siemens, Smurfit Kappa, TPG and Travelers, among others. Its clients also include multilateral organizations, such as the Inter-American Development Bank, IDB Invest and the Pan-American Development Foundation. LLYC’s office is located on Brickell Avenue, in the heart of Miami’s financial and business district.